The following is an article published in The Record, the newspaper of the archdiocese of Louisville, KY. Donna Lang, now of Louisville, was a founding member of the CEO team in Cedar Rapids. Catholic Evangelization Outreach (CEO), a ministry of St. Margaret Mary Church aims to reach both active and in-active Catholics. The ministry draws inspiration from the words of St. John Paul II: “It is not enough for us to receive Jesus Christ ourselves, we must also bring Him to others,” said Donna Lang, CEO coordinator. Each month, a CEO event takes place after the 5 p.m. Sunday Mass. An individual shares a witness talk about their relationship with Christ and the church. Following the witness talk, there is time for fellowship and a light meal. The next CEO event is Jan. 15 at 6:30 p.m. Archbishop Joseph E. Kurtz will be the speaker. Donna Lang gives her personal witness at St Margaret Mary Church in Louisville at a CEO event. 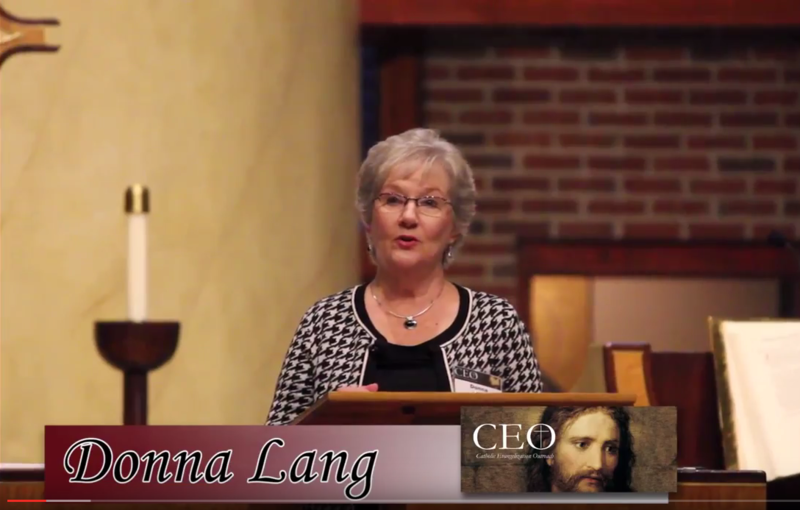 At its heart, Lang said, CEO aims to renew and re-energize people and parishes through these witness talks. “The lay-driven part is so important,” she said, noting that the evangelization ministry is a grass-roots effort. Lang first became involved in CEO when she was a parishioner in the Archdiocese of Dubuque, Iowa. When she relocated to Louisville and joined St. Margaret Mary in 2015 she brought the ministry with her. Michael Bartley, a parishioner of St. Margaret Mary, gave a talk last year about his “personal demons” that kept him from fully embracing his faith. “My hope was that by sharing how God has acted and worked in my life that it might help others become more aware of how God is acting in theirs,” he said. Bartley continues to be involved by providing music at each of the CEO events. He plays guitar and his daughter, Rosie, a senior at Assumption High School, sings. The ministry at St. Margaret Mary completed its first year last June and coordinators said they hope to expand the ministry to other parishes in the archdiocese. Parishes or faith formation directors that are interested in the CEO ministry are invited to contact Lang at 709-5077. “My hope is that it changes people, that people return to the church, return to reconciliation. If one heart is changed at each event, we will feel like we have done our job,” Lang said. To learn more about the CEO ministry at St. Margaret Mary or to watch past talks, visit www.stmm.org/ceo.